I got away early from work Friday and drove directly up to the mountains. I was hoping to get started before dark, but Rt 42 was washed out and I had io detour through Hunter. Drove up Friday. At this point I decided to skip Halcott and concentrate on North Dome and Sherrill. I arrived at the Devils Path trailhead just as it was getting dark. No one else was parked there. I quickly packed and took off into the dark. The weather was warm, finally, and I was trying out my newer, lighter, backpack for the first time. I had my lightest sleeping bag, my new bear cannister, the hammock, and minimal extras. No stove or cooking suplies. The pack felt wonderfullly light. I was hoping to get a little distance up the trail before heading into the trees and making camp. But the magic of hiking through the dark just drew me on and on. I could not see the stream beside the trail, but I could hear it clearly when I would come near. I never really had trouble following the blazes and the trodden-down path. 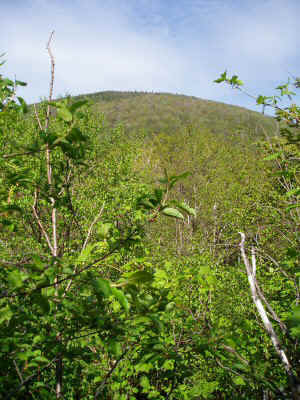 I suddenly saw a sign on a tree, marking the point at which the trail attains the ridge. I was lucky they put a sign here, because it looks like the trail continues upward. The left turn is not nearly so evident in the dark. I veered left, skirting the marsh (which I could not see) and found a wonderful hiding place in the trees beyond. A few minutes later I was resting comfortably in my hammock, and sortly after I was asleep. I am getting better and better at sleeping in the hammock, because I slept soundly all the way till 6AM. I work refreshed, and within a few minutes I was packed up and ready to go. All night long the frogs in the nearby marsh were peeping up a storm. Something with a much deeper growl-like sound would interrupt periodically. Something was dropping on the hammock netting, something that sounded like a light rain, but it was never wet to the touch. In the morning I figured out it was catapiller droppings, for the catipillers and inchworms were hanging, climbing, dropping, and crawling everywhere. When I got up I went looking for the trail sign I had seen before, and had some difficulty finding it because my sense of direction was a little off. Luckily I checked the compas, or else I would have set off to climb the wrong peak too. The route up North Dome was steeper than I had expected, with numerous rock bands and cliffs. I found a way up each of them, but noth without some backtracking. I never found anything that looked like a use-trail. After an hour of continuous steep climbing I sit down to rest a while, and when I start back up again it turns out that I have passed the last steep section, and I am on the summit plateau. 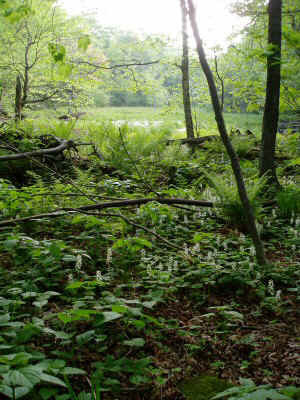 It is not long before I encounter use trails, which I can follow through the thickets of balsam. The trails veer off in several directions, but paying attention to the compas, I follow the trails right to the cannister. 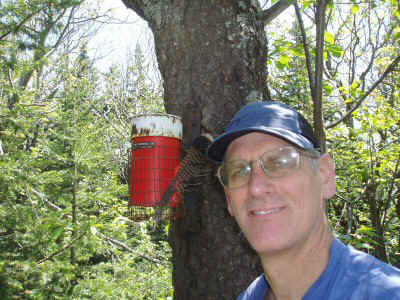 I later consult the comments on the web and find ut that this cannister is one of the hardest to find. Not today. When I arrive, it is only 8:30 AM. As before, informal trails headed off in several directions. I followed the main one, which seemed to be going to Sherrill, bt after a while I looked at my compass and found I was descending to Spruceton. I changed direction, and headed towards Sherrill instead. The descent was much more moderate than the ascent. Part way down toward the col I discovered a charming creek, where I stocked up on water and had a snack. This would make a wonderful camping spot. I continued down to the col, then up again steeply towards Sherrill. Down by the marsh, there had been lots of mosquitos, which were not aggressively biting. Farther up, there were similar swarms of flies, again not biting. Fortunately, when I was moving I largely left these behind, but it did provide an incentive to keep moving. On the route from North Dome to Sherrill I was able to follow a faint path most of the way. I occasionally saw red blazes. I did not seriously attempt to keep track of either, as the way up was clear enough. I began to realize that all routes UP lead to the peak, so you cannot really go wrong, but all routes DOWN go different places, and you have to pay attention. This sudden need to change navigation strategy has never been so clear to me before. Again, I followed the path and suddenly realized something was "different" so I looked around and thee was the cannister. I could easily have missed it and spent a while searching, but again I walked right up to it. On each of these peaks I found the cannister easily without the GPS, but in both cases it was less than 100 feet of the GPS coordinates. I had been thinking of descending to Rt 42 and hitchiking back to the car, but since it was closed, I figured the traffic would be very light and I might have to wind up walking many miles. So I decided to descend north, back to West Kill. I got started a little too far to the east, and the slope kept pushing me more and more that way. It was a struggle to keep from going intothe east drainage, Finally got to the proper ridgeline and the descent was much easier. Next time, I will be sure to pay attention more near the top. 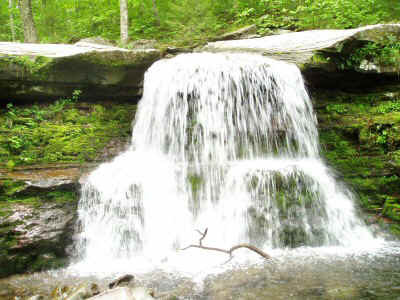 Wen I got to West Kill, I could see it could not easily be crossed without getting wet. I descended to a wide spot, then waded across in my boots. The water was cold and fast moving, but was only to mid-thigh dept, and I crossed without incident. I had to cross a farmer's field and hike back two miles on the road. It was suddently quite hot out in the sun. I debated whether to head up Halcott or Rusk and spend another night, but I was pretty tired and decided to head home. But before I did, I drove to the end of Spruceton Road and hiked up West Kill to the falls. In contrast to Devil's Path, this section of trail seems heavily used and less than wild. There are three separate parking areas, some pretty large, for this one trailhead. The lean-to was only 0.7 miles beyond the falls. I would hesitate to plan to stay there, so close to such a popular trailhead. On this pleasant Saturday afternoon, however, there was only one other car in the parking area, and it belonged to another dayhiker who was returning from the falls. In fact, this persone was the only other hiker I saw the whole trip.